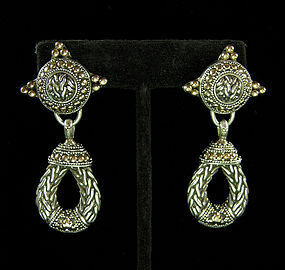 Super wearable and versatile earrings in sterling with 18KT gold accents. Marked with the John Hardy JH signature initials and also marked 18K and 925. Circa 1990. Guaranteed authentic, from an estate. These have been recently professionally converted to pierced. 2 3/8 inches long and 1 inch wide. Excellent condition. Photos enlarged to show detail.